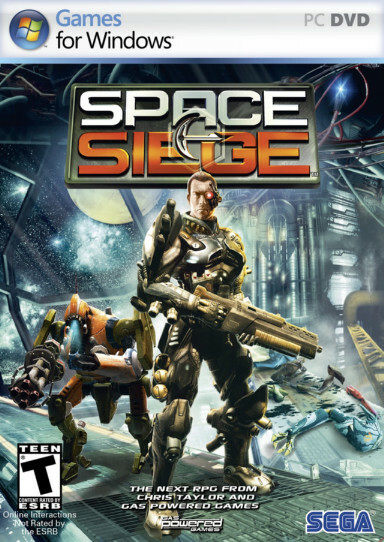 Space Siege is going to be the third Siege game from Gas Powered Games, following in the footsteps of Dungeon Siege (released in 2002) and Dungeon Siege II (2005). Recently, Gas Powered Games made a demo available for Space Siege, and while the demo is relatively short (it only includes the opening cinematic sequence and the tutorial level), it gives a few ideas about how the game is going to work, and that's what I'll be covering here. One thing you can say about Gas Powered Games -- they never stick to a formula. The first two Dungeon Siege games weren't anything alike, except for their setting, and now Gas Powered Games is changing that as well by sending the player out into space. Space Siege takes place in the future (2202 to be exact), in a universe where humanity has finally figured out how to explore the stars -- but where they've also bumped into another space-faring civilization, the Kerak, who don't like to share. As the game opens up, the Kerak launch a surprise attack on humanity, and the battle doesn't go well for the humans. You play as an Allied Security Force soldier named Seth Walker, and when Kerak assault troops board your ship, you have to eliminate them so that your ship and crew can survive to fight another day. The demo only includes the battles on your ship, so it'll be interesting to see how a single human soldier can defeat an entire assault force and save humanity (because you know that's where the game has to be going). Space Siege seems like it's going to be a little bare-bones. From what I can tell, you'll only be able to play as Seth Walker, and you won't have any options for what he looks like or how he starts out. The game is going to use a classless system, where you'll pick the skills you want to build up, but it looks like the only major decision you'll have to make is whether you'll stay completely human or if you'll add some cybernetic components to your body to become more of a machine. Your status in this way will determine which skills you can learn, which weapons you can use, and perhaps which quests you'll be able to go on. Similarly, there doesn't appear to be much in the way of equipment. There isn't any armor at all, and the interface only shows room for ten weapons (five melee weapons and five guns). I only saw three weapons in the demo, including a chain gun that you can only use if you install some cybernetic parts onto your body. Otherwise, enemies only drop (upgrade parts,) which you can collect and use to improve your weapons and defensive ratings. You can also use the upgrade parts to construct health kits and grenades, but this probably won't be too necessary since those items seem to be in plentiful supply. The nice thing about limited equipment is you won't have to juggle it around and repeatedly return to a base to sell the excess. You'll be able to just concentrate on killing bad guys. The bad thing about the equipment is that it leaves something of a black hole in the game. With character development looking sort of basic, and with no equipment to search for, can the combat alone keep the game fresh and fun to play? From what I saw of the demo, it's tough to say, but Gas Powered Games has been good in the past, so I'll stay cautiously optimistic. Finally, even the interface is streamlined. Everything is controlled using the mouse. You left click to move and interact with objects, and you right click to engage enemies. You can zoom in pretty close to your character, but oddly you're not allowed to use the keyboard to move him. With enemies always shooting at Seth, I kept wanting to use the WASD keys to dodge their fire, but all I could find was an (evade) key, which always makes Seth do a forward roll, which doesn't seem particularly useful. I'd rather be able to dodge side to side. The demo only lasts for about 20 minutes, and it doesn't allow you to gain a level. It also doesn't show much in the way of character interaction, so while I've seen that you get to use some sort of a sidekick robot named HR-V, the robot didn't make an appearance in the demo, and so I don't know what it adds. And thus I have no idea if there's any sort of interesting story involved in the game, or characters you can care about, or even some HK-47-esque moments to chuckle over. At about 1 gigabyte, it'll probably take you longer to download the Space Siege demo than to play it. The game doesn't look bad in the demo, but it appears to be a little more basic than I'd prefer, and it doesn't do anything to differentiate itself from the likes of Shadowgrounds and Space Hack. I enjoyed those other games well enough, but they were both bargain titles, and if that's all Space Siege ends up being, then it would have to be considered a massive disappointment coming from the talented game-makers at Gas Powered Games.